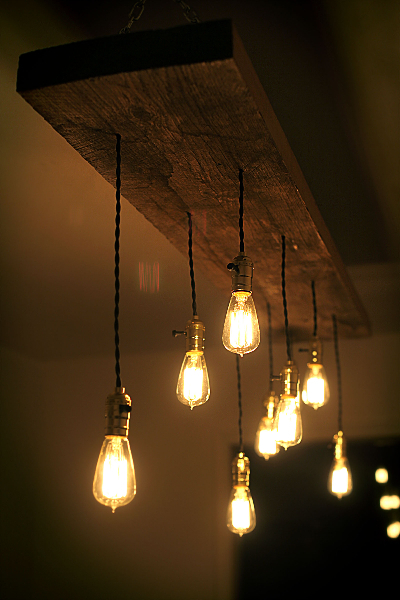 Once you’ve selected your lumber, drill a hole for each light cord. I started with a spacious zig-zag pattern but it’s whatever you like really. 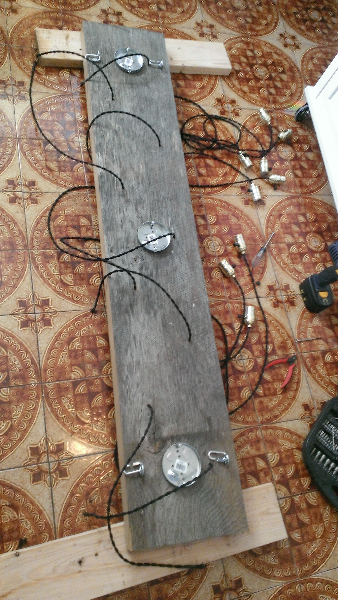 Affix junction boxes to the top-side of the lumber and wire the lights into them. Screw an eyelet into each corner of the top-side of the lumber, at least an inch in from any side. 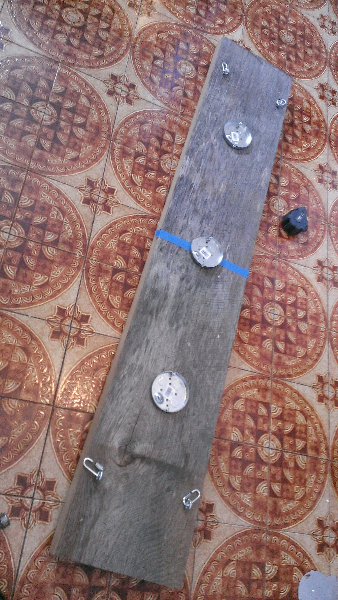 If the lumber is extra heavy you could consider another length of chain and place two more eyelets to support a chain in the center. 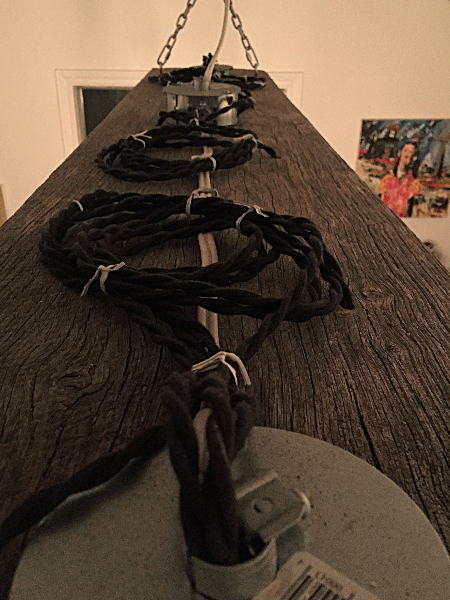 If ceiling joist placements allows you could also use four lengths of chain straight up to four hooks instead of the swing system I employed. 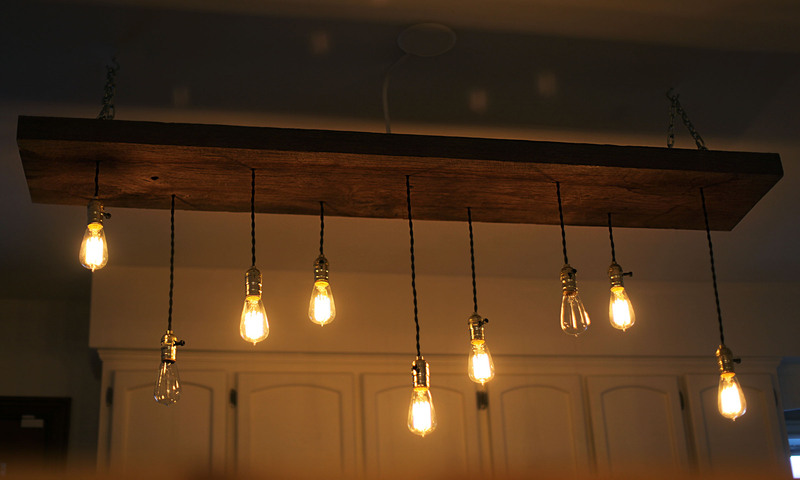 Screw the hooks firmly into ceiling joists, hang the fixture and wire whichever junction box is closest into the ceiling electrical. If possible the power cable would be less noticeable if it snaked to the ceiling along one of the support chains. Once hung you can adjust the heights of the hanging bulbs and coil the extra cable on top, it’s not coiled very neatly in some of these pictures but I have since remedied that. There you have it. 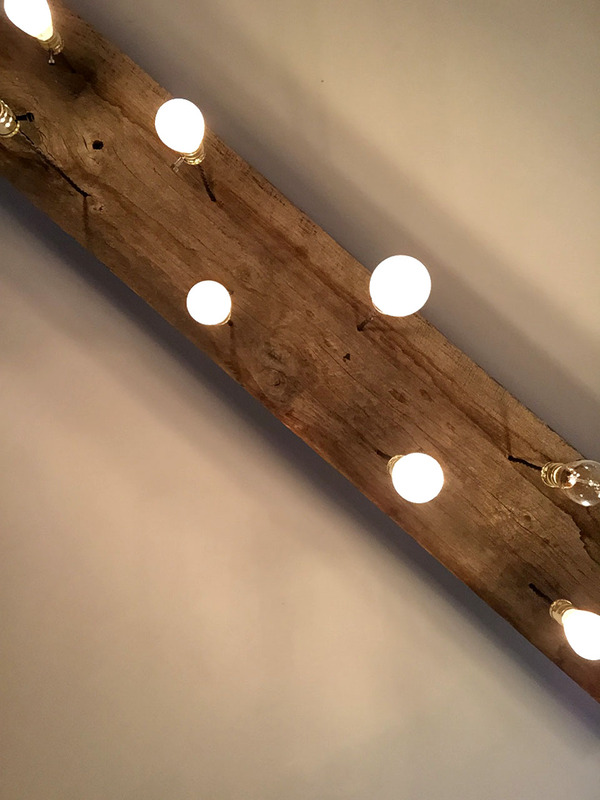 If you’re interested in other Edison-style lighting ideas check out DIY steampunk-style iron pipe Edison fixture and the reason I have so many Edison bulbs kicking around, Maker Wedding: Rustic Edison-style hanging light fixtures. 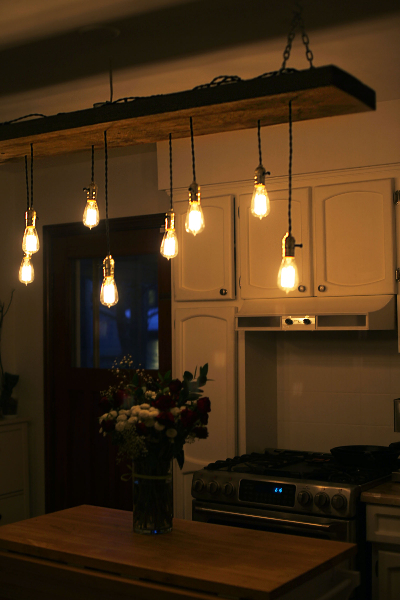 These bulbs are 40 Watt, you can get them here. hi, do you have any photos of how exactly you ran the wires to connect all the lights? Any chance to snap a couple quick photos of what’s on top of the light fixture/board? Thanks!!! I added a photo showing the top side of the fixture. 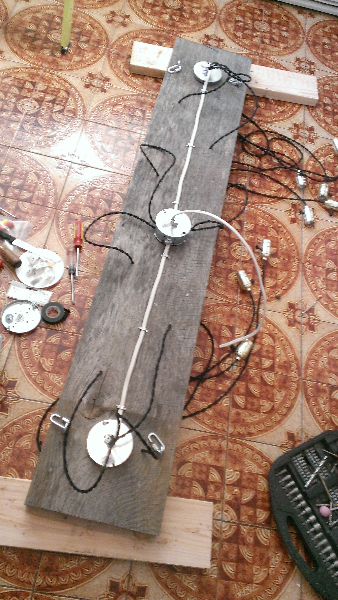 I did not cut the light wires to length as I may use them in another project down the road. I coiled them neatly and just used some twist-ties to secure them. What are the measurements on your lumber? I really like the overall scale and composition of the piece. Well done! How much of the twisted cotton wire did you end up using for your light! I would say under 30′ of the twisted cloth covered wire, nine lights, under 3′ of wire each. Can you tell me details on the larger white electric wiring on the light. My husband and I are trying to build this today. Any tips would be greatly appreciated. Any problem with doing a plug end instead of hardwiring into electrical? See my reply below. Best of luck. Also I meant to ask Do they have to be three-way sockets since the bulbs are only regular non-three-way bulbs? No problems with using plugs at all. Grounded sockets are always better, but are not required for these lights as they are indeed not grounded (two-wire). The larger wiring is just standard Romex household wiring, usually it’s behind drywall or whatnot. How far is your board from the ceiling? The top of the board is 10″ from the ceiling. This measurement is going to depend heavily on your ceiling height, lumber size, room size, desired look, etc. Well I finished mine!! Thanks so much for the inspiration! Any way to post or show you a pic of my finished product? Courtney, I’ve added an image uploader to the post so that you can share and image or two of your results. Thanks for reading! Phil, this is so awesome! I’m doing this to my home in the next couple of weeks. I’ll let you know how it turns out!